On 13 years of the government of President Evo Morales, both politicians and leaders opposed to the Movement to Socialism (MAS) consider that this continuous period was characterized by the waste of public resources and a deep division among Bolivians. 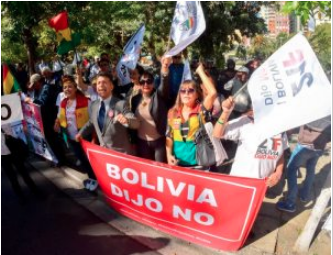 Despite the economic boom due to the price of raw materials in the international market, corruption prevailed and the health sector was the most affected, in the opinion of the binomial “Bolivia says No”. “The health sector was the most neglected sector, something unforgivable, because people continue with the same old hospitals, where the equipment is deficient and they fulfilled their cycle; the Constitution says that you should have free health and it was not fulfilled,” said the senator and candidate for vice president of the alliance of “Bolivia said No,” said Edwin Rodriguez. The Government intends to get rid of the problem, arguing that it is the responsibility of departmental governments, the issue of hospitals, but the competencies of departmental governments began between 2010 and 2011; and the Government already had about five or six years prior to be able to attend to basic aspects, he specified. For the ex-leader of the organization of young Yungueños and current activist of 21F, Franz Gallegos, with the government of Evo Morales there was much expectation, that’s why the National Council of the Youth was created; however, the MAS only took care to divide the social organizations. This entry was posted in Bolivia, Business, Drug war - narcotraffick, Economics, Energy, Environment, Mining, Politics, Social Unrest and tagged corruption in public office, demagogue, democracy in peril, government failures, Ochlocracy. Bookmark the permalink.